It is unlikely that it will ever be 'finished' in a completion sense, because remembering stimulates memory. Each story recalled gives re-birth to other stories, related and unrelated. They will be added as long as there is a shred of truth in them, and the whole project has not yet collapsed under its own enormity. I could say that it is written for my children, Richard Dean and Jerri Jeane, for indeed it is. But, in truth it is written for me, because it is something I wanted to do. Why? Because I like to talk about myself, and no one knows me quite as well as I. The memories are mostly my own. Some of my stories have faded with memory. Since many of them can no longer be refuted or substantiated by persons living, they shall stand as 'history'. Embellishment is thus confessed, for indeed that is a part of me as well. To the best of my knowledge that is my only fault and certainly the only one which will be revealed herein. This writing is dedicated to my best friend, Judith Roxann, who has been a part of my life since I was 16 and she was 15. She inspired many of my life's experiences and resulting stories. She has also reminded me when her recollections of my stories differ from my own. Nevertheless, these writings shall not be diminished by strict adherence to fact. I once heard an actor/comedian remark on being honored for his accomplishments that, "I will remember this evening as long as I can". I don't recall who said it, but I've borrowed that line many times in recent years. To you, dear reader, I urge that you keep a journal of anecdotes of your life, for your own musings, if no other. 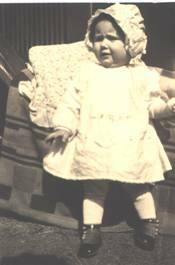 My sister, Esther Joann, was an only child, or so it seemed. She was born on an isolated farm a half dozen miles northwest of Corbin, Kansas in June 1927. Our family doctor drove a horse and buggy and therefore couldn't or wouldn't travel at night. The day before my sister was born the doctor was notified, and she drove her buggy out from Corbin to spend the night. Yes, she drove her buggy. Joann arrived on schedule, healthy and happy. The doctor returned to Corbin to cook in her cafe. It seems that the Corbin community was too small to support the doctor, so she and her nurse also ran a cafe, and they lived in the back of the same building. The 1920s and 30s were pretty tough times in southern Kansas, as they were in a large part of our country at that time. 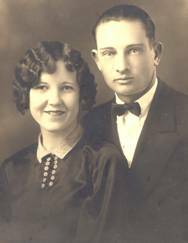 Grace Esther Theota Smith and Herman Niebaum were married on September 9, 1926. Dad was 24 and Mom was 20. Mom had 4 names and Dad had only two. Mom always said that was a good balance. They wanted very much to farm, but had little with which to begin a farm life. So, at the time Joann was born, they were living with Mom's parents, Susan Martha and Joseph Grant Smith. Though tractors were in use then, the Smiths farmed with a team of horses. Herman always referred to his father-in-law as 'Dad Smith'. He said that Dad Smith couldn't drive his team straight to save his soul. Dad recalled that one day after planting all day with the team he asked, "Dad Smith, how are you ever going to cultivate those crooked rows?" Without missing a beat Granddad replied, "Why, I'll just use the same horses!" Dad loved sharing that story, and he always laughed the most in its telling. They moved to Corbin when Joann was 6 months old, and later to the farm on the Chikaskia River southwest of Corbin. Herman and Grace were both born in different parts of Oklahoma Indian Territory in 1902 and 1906 respectively. Oklahoma didn't become a state until 1907. Dad was born on a farm southeast of Caldwell, Kansas, just south of the Oklahoma/Kansas border. Mom was born on a farm near Minco, Oklahoma. Both were born to 'farm' families, when farm meant both crops and animals. 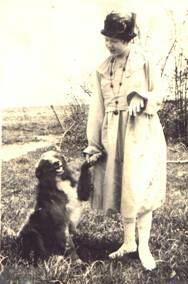 When Mom was 7 she and her family moved to southern Kansas in a covered wagon. Her mother tied a kewpie doll to a string and hung it from the top of the wagon for her to play with on the trip. She remembered that experience all her life. Both of my Grandfathers, Louis Niebaum and Joseph Smith, made the 'run' into the Cherokee Strip when it opened for homesteading in 1893. Louis was about 25 and Joseph was about 30. Both staked claims for 160 acres. Granddad Niebaum couldn't farm his claim, since he had nothing to farm it with. He traded his claim for a wagon and a team of horses. Granddad Smith had even worse luck. He returned to Kansas for his family and someone removed his markers, claiming the land for their own. Granddad went to court to prove rightful ownership, and lost. He always believed that his lawyer had been paid off by the other parties, and never trusted a lawyer thereafter. "Born in or near Hanover Germany came to this country as a young Lad about 16 yrs of age. Disembarking at New Orleans and boating up the Mississippi River. Spent some time in Cincinnati, Ohio working as a carpenter helper. 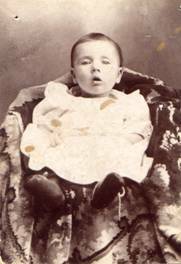 Henry was born 1833 and with the records I have I would say anytime after the 17th of Nov. and the month of Dec. Earning money and sending back to Germany for his mother and two Brothers to make the voyage to this country, which they did. We assume they are buried in or around Cincinnati. Do not have any idea of their names. I do know Henry went back to Cincinnati later in life to visit his relatives before his passing. Thru the records we find Henry moved around some early in life here in this Country. Was enlisted in the Union Army at Aurora Ind. April 20 - 1861 for a period of 90 days. I really can't believe Henry was married during this time as his first-born came Aug 22 - 1863. Though maybe Herman isn't the first-born as there is mention of a sixth child reading his obituary and somewhere along the line this information was passed on as the children wrote the obituary. The first three children were born in Switzerland Co Ind. Herman, Katherine, and John. I would rather think the Lady he married Margaret Meinken also an immigrant of Germany was located in this vicinity Switzerland Co Ind. In the year 1868 Henry and Margaret and three children migrated west to Leavenworth County, Kansas. They are on the Census of 1870. Also Louis Niebaum the fourth child. Henry and Margaret settled in the area of Neely Ks. And thru the info I’ve received the place is still standing though some remodeling has took place. Margaret Meinken Niebaum died 1876 Leavenworth Co Ks leaving Henry with a very young family. 41 yrs of age. There is no record of where she is buried though we are sure she is buried in Fall Creek Cemetery Jarbalo, Ks. The cemetery was not plotted until 1880 so they were buried side by side called potters field, which is along the fence on the north side of the Cemetery. There is a large part of the Cemetery consumed by Meinken’s, which joins potters field. I have reason to believe this as the Cemetery sexton John Meinken who was a nephew of Margret Meinken. He was close to 80 at the time and convinced me of this. Henry Niebaum remarried Nov 18 - 1880 Leavenworth - Kansas to Mary Jane Schenek previous marriage by name Vanpelt two son's Nelson Vanpelt - Everett Vanpelt. Henry Niebaum died at Caldwell Ks. 24 June and was brought here for burial. Henry Niebaum was born in Germany 1833 and died at Caldwell Kansas 24 June 1921 age 88 years. His early life was spent in Ohio and Indiana. He came to America at the age of 16 years. He came to Leavenworth Co Ks 1868 and has lived in this vicinity ever since. He was married to Margaret Meinken and after her death was married to Mrs. Jane Schenck who died Jan 5 - 1910. There were 6 children 5 of whom are living. They are William of Tonganoxie, Louis of Caldwell, Ks also Herman and John of Okla. Mrs. Katie White of Okla. All of whom were present at the funeral services at the Friends Church in Tonganoxie, Tuesday June 28th conducted by Rev. H.A. Cook. He was a good citizen and a loving husband and father. I'm not certain who wrote the history above or when, but I believe it was written by my cousin, LeRoy Niebaum. He has confirmed that those seem to be his words, but didn't recall having written them out that way. A few years ago when my sister and Dad were visiting us in Lawrence, we decided to try to find Great Grandfather Henry Niebaum's gravesite. I'm told that the small flat gravestone has only the initials H.N. We had only a general idea where the cemetery was located. As we drove west out of Tonganoxie Dad identified the farm area where the Henry Niebaum farm had been located. After a few miles we drove north on a gravel road according to directions we had been given in Tonganoxie. We found the only cemetery in the area (Eagle Cemetery) and searched with no success for a stone with H.N. We did find gravestones with the Worland name. Dad said, "Well my mother's maiden name was Worland", but he couldn't recall their first names. After some pondering and discussion with Dad, I said, "I have a feeling these folks were of some importance to us." Whereupon, Joann took a picture of the gravestones. Later we verified that these indeed were the gravesites of Grandmother Niebaum's parents, our Great Grandparents. We also discovered that we had been in the wrong cemetery and never did locate the right one for Henry Niebaum. I very nearly never came to be. One evening when Joann was about 3 years old, Mom & Dad were returning to Corbin from Caldwell. Car trouble forced them to stop on the shoulder of the road. Dad was trying to fix the engine while Joann was asleep on Mom's lap in the front seat. Two old drunks approaching in a car from the rear hit their car full force, driving Dad through the windshield. The passenger seat broke backwards as Mom & Joann were showered with broken glass and gasoline from a punctured tank. Mom always said that having gasoline in her ear was one of the most painful things she ever experienced. Joann has confirmed that and still remembers that pain, though she was only 3. Dad was unconscious for more than a day and there was some thought that he might never recover. He did! Mom recalled that she combed glass from her hair for days. Anytime I ever heard that story from the family it was always told as "two old drunks". Both were blamed equally, and the causes were implicitly attributed to both age and level of insobriety. When Joann was 3 the family moved in with Grandma & Grandpa Niebaum in Caldwell. Times were really tough then. Joann says she was 7 before she ever had a bed of her own. She remembers awful dust storms in the 30's. Mom used to describe hanging wet dishtowels in the windows to keeps the dust from coming into the house. Mom played piano for dances with Dad's younger brother, Lynn, and a family friend, Elias Whitten. We called him 'Whit', and he was a lifelong fishing partner of Dad's. Lynn played banjo, guitar, and fiddle, while Whit played fiddle. Joann says that she recalls going to those dances and falling asleep on the pile of coats of the guests at the dance hall. Whenever Dad & Mom spoke of those times it was always with a great amount of pleasure and pride. Dad would brag about how good Mom was. She would talk of the great times they had. Dad had a special bond with his brother, Lynn, and often inadvertently called me Lynn throughout my life. Mom was a happy person and looked on the good side of most everything. She had a great sense of humor, and was well liked by all who knew her. She also enjoyed pampering her only son. Nearly every night she would fix hot chocolate in a glass for me to drink in bed, and often would fix breakfast for me to eat in bed. Joann says I "drank from a glass at 4 months because I wouldn't adjust to a bottle". But, I'm ahead of my story and haven't even been born yet. Mother's Day, May 12, 1935, also could have been disastrous for me. The family was preparing for a picnic in Caldwell. Dad & his brother-in-law were riding with Granddad Smith two miles north of Corbin. A fast-moving car hit them broadside on Granddad's side, throwing him from the car. He died enroute to the hospital. Dad and his brother-in-law, Horatio Hardin were not seriously injured. Shoate (Horatio) Hardin was married to Mom's sister, Edith, at that time. I don't recall ever seeing his name written, so the spelling is my best guess. Shoate and Edith had a daughter, Bonnie, about my sister's age, and they were good friends. Grandmother Smith was unable to continue with the farm, and gave it up to her youngest daughter, Finace, and husband, Ralph Watts. From then on Grandma Smith stayed for a few months at a time with each of her children for most of the rest of her life until her death in 1954 at age 89. At the time of her sudden death she was planning to remarry a friend from her youth. One of life's great regrets is missed opportunity to review the history of one's ancestors with those who are best able to relate it. That wisdom comes only with age and by then, the chance has passed. As a child I spent many hours with my Grandmother Smith, but never asked the many questions I now have. How I would love to question my grandfathers about their 'run' into the Strip in 1893. Or, to hear Granddad Smith tell of his time as a cowboy in Colorado when his family lived in a tent near Trinidad. Or, once again hear Grandmother Smith tell about walking to school clacking two bones together to scare away the wolves and coyotes. Unrecorded memories pass to oblivion. Unrealized dreams are left to new dreamers.